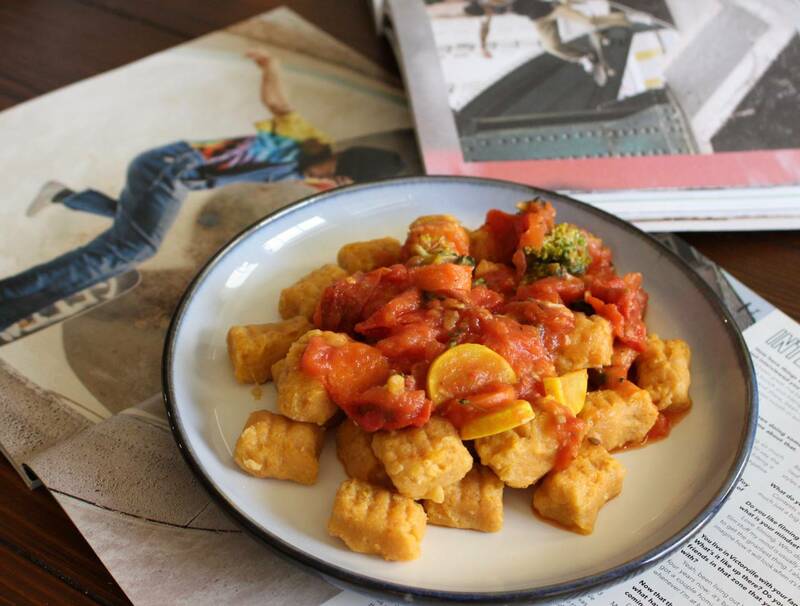 Sweet potato gnocchi (Gno-Comply) on a bed of CJ Collins’s profile from Issue #1 of Berrics Magazine. Prep time: 60 minutes; Cook time: 5 minutes. Though it’s still in its infancy when compared to other sports, skateboarding is beginning to reveal itself as cyclical. Blind is once again manufacturing pants that would otherwise function as parachutes; Welcome Skateboards, among others, has normalized the shaped board; slappies are now trendy instead of taboo (and with the occasional mind-blowing combo from Mark Suciu, it’s not hard to see why). Osiris put the D3 on the market again, and Globe has re-issued the Chet IV—what other proof do you need? One other vestige of the past that is gaining its second wind is the maligned no-comply. While skateboarders love to laugh at the layperson who asks, “How do you get the board to stick to your feet?” perhaps no other trick makes even veteran skaters scratch their heads and ask, “How do you get the board to stick to your… knee?” It would be unfair to insinuate that the no-comply ever left. One can find entire montages about the no-comply dating back to 2015, which by all means should have been a dead zone for this somewhat archaic trick, as it was the calm before the proverbial storm of nostalgia. Indeed, even well after the no-comply’s initial heyday, Brian Anderson sparked some 360 no-comply intrigue in his line at skateboarding’s most infamous 3-up-3-down. While none may ever be able to make it look as amazing as Ray Barbee did (and still does), it has come full circle and is now regularly seen down stairs, in pools, and on approximately 25% of all Instagram clips in one combination or another. Much like the no-comply is a fractured take on a more traditional (at least from the 90s onward) approach to tricks, I’ve been looking for a less traditional pasta dish that would do well drowning in homemade pasta sauce. Enter gnocchi. 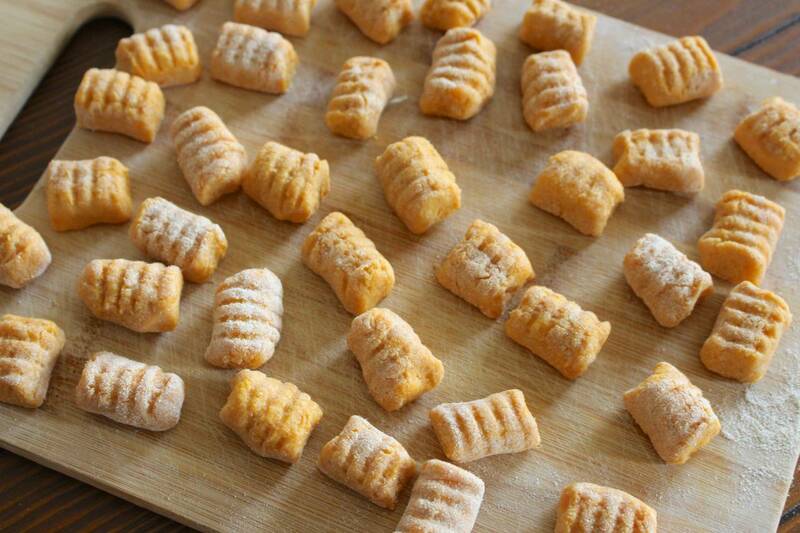 Traditionally pronounced nyawk-kee, gnocchi are (yes, gnocchi is the plural of gnocco) Italian pasta dumplings made from a number of potential ingredients, including semolina, potatoes, wheat flour or even cornmeal. For a lighter, fluffier take on pasta, look no further than these fluffy clouds of deliciousness. Because there’s no need to actually make these into noodles, it’s easier to make these out of non-wheat ingredients with minimal equipment. 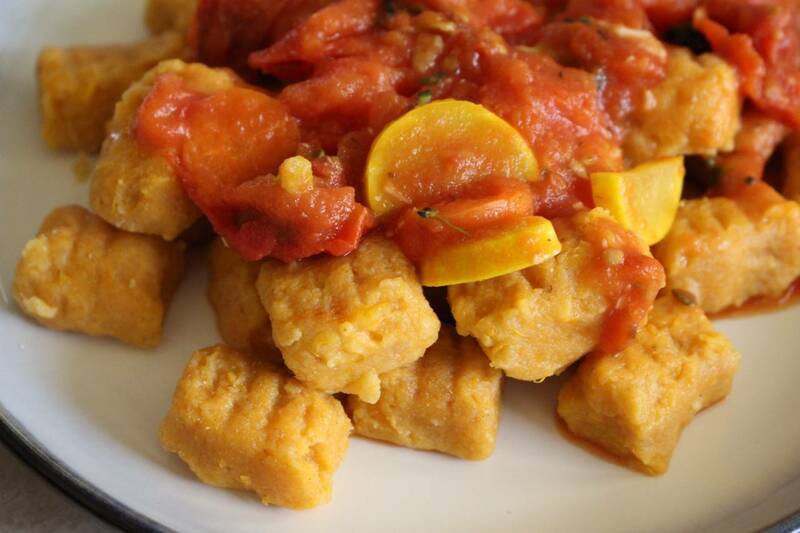 Because of my never-ending allegiance to the anti-inflammatory powers of the sweet potato, this week’s recipe is Gno-Comply: Sweet Potato Gnocchi with Roasted Roma Tomato Sauce. While the sweet potato gnocchi make for a tasty dish, I’d be remiss if I didn’t gush over my homemade roasted Roma tomato pasta sauce. Pasta sauce from a jar will always do in a pinch, but if you’ve got the time, nothing beats a homemade sauce that’s loaded with veggies and has significantly less sugar than the pre-made stuff. I highly recommend taking the additional 40 minutes of prep time to actually roast the garlic and the tomatoes for that extra rustic touch. 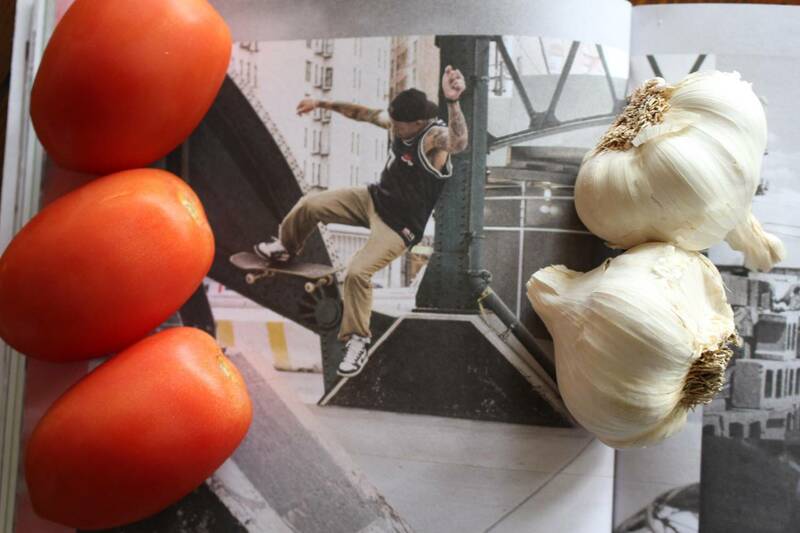 If you can take a whole afternoon to learn an unfathomably difficult no-comply in or out of a ledge, you can take the extra time to make some exquisite pasta sauce. Without further ado, let’s get cooking. Preheat the oven to 400°F. Time to prep those sweet potatoes. While I typically recommend baking them to soften them up, it’s acceptable to just microwave them here. 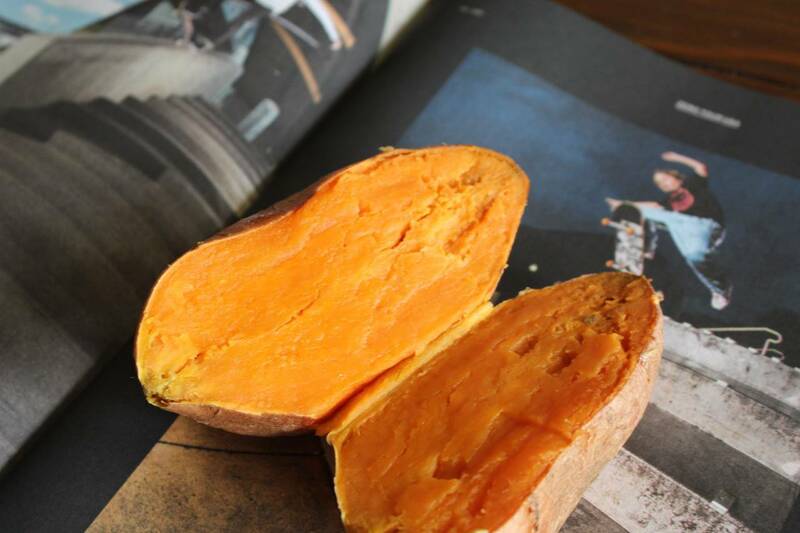 Using a fork, poke some holes on all sides of the sweet potatoes and throw them in the microwave for 4 minutes; take them out, flip them over, then microwave for 4 more minutes. Let them cool for 20-30 minutes. While those are cooling, grab your garlic. The best way to roast garlic is to use the whole bulb. Cut the top off of the bulb so that you see the trypophobia-inducing garlic patter underneath. Drizzle a teaspoon of olive oil over the garlic so that it seeps into the pattern, soaking it from within. Use another teaspoon of olive oil to lightly coat the Roma tomatoes. 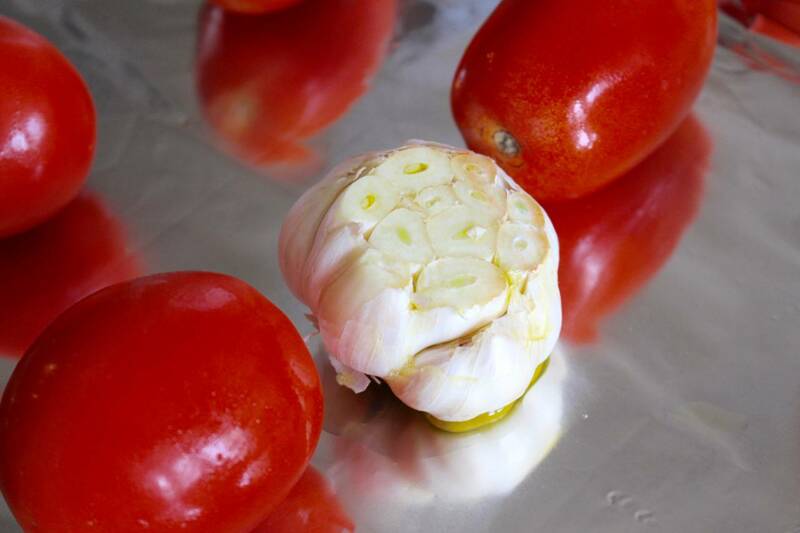 Place the garlic and the tomatoes in the oven for 40 minutes or until the garlic is browned and the skin of the tomatoes is starting to slide off and change color. Remove them from the oven and let them cool for a few minutes. While the tomatoes and garlic are cooking, scoop out the insides of the sweet potatoes (enough for one compact cup of mashed sweet potato) and throw them into a mixing bowl (mash with a fork if not already mashed). Because this dough requires very little kneading, adding the flour works best if you flatten the sweet potato out across the bottom of the bowl and then add the flour on top so that almost everywhere is equal parts flour and sweet potato; knead it lightly until the dough is formed. Dust a cutting board or other flat surface with a little bit of flour and separate the dough into four pieces. Roll each piece into a string about as thick as your thumb and cut it into 10-12 equal pieces. Using a fork, etch some grooves into each piece. In a large pot, bring 6-8 cups of water to a boil. Throw the gnocchi in there for 2-3 minutes to cook, or until the gnocchi floats to the top and becomes firm. Dump the gnocchi using a strainer and set aside. To finish off the sauce, heat 1 tbsp. of olive oil on medium heat in a large sauce pan. Mince 2-3 cloves of the roasted garlic and throw it into the pot with the chopped broccoli, squash and carrots and cook for 2-3 minutes. Toss in the roasted tomatoes and mash them with a masher or fork until they are largely liquefied with only small chunks of tomato and skin remaining. Add in the 8 oz. of tomato sauce and stir in the onion powder, basil leaves, coriander, oregano, salt, pepper and crushed red pepper. Stir and let cook for 3-4 minutes or until all the sauces, veggies and spices are warm. 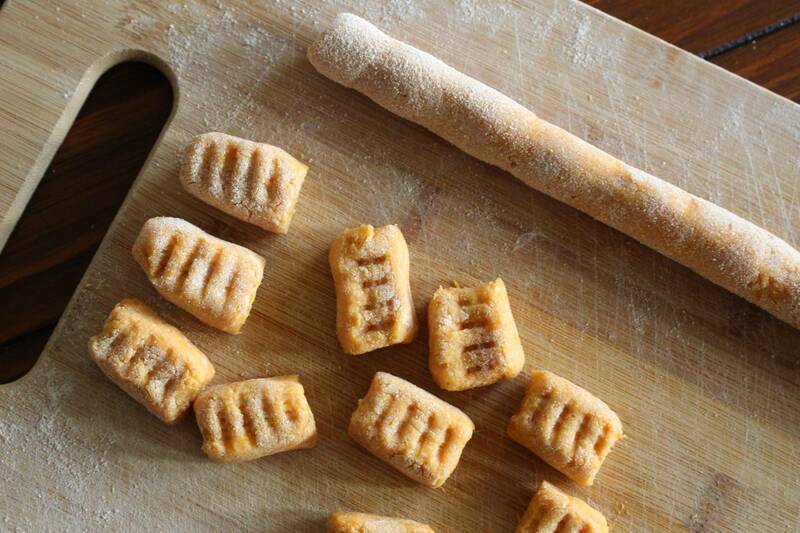 Serve over the gnocchi and go learn some gno-complies! Sebo announced that he was parting ways with his shoe sponsor this morning.